Daniel’s performance was commended by many audiences that he already exhibits a very distinct personality and musical maturity with his technical ability and captivating way of communicating with the audiences. In the most recent solo performance with an orchestra, the conductor commented that Daniel’s rendition of Tzigane was full of fireworks and it’s not something to be missed. 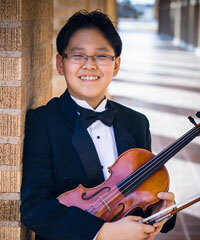 His musical talent has been recognized on many occasions in concerts and competitions including: Overall Winner and String Category Winner in Walgreens National Concerto Competition, First place in the American Protégé International Concerto Competition, Second Place in the New York International Artists Violin Competition, Judge’s Special Prize in the Fort Bend Symphony Orchestra’s Marielle Ogletree Young Artists Concerto Competition, First Place in the Houston Civic Symphony’s Young Artists Concerto Competition, First Place in the Texas MTNA Performance Competition, Division Winner of MTNA South Central Region Performance Competition, First Place in the Youth Orchestras of Lubbock (YOL) Concerto Competition, LMTA Piano Sonata Competition, and Jack Hendrix Piano Competition. As a result of winning these competitions, Daniel has been honored to perform in the prestigious musical venues such as the Carnegie Hall in New York, Bennett-Gordon Hall at Ravinia in Chicago, Morris Cultural Arts Center and Stafford Centre in Houston. In addition to his solo performances, Daniel is currently holding the Co-Concertmaster position of the Symphony Orchestra of YOL (the highest group of the YOL orchestras) and has been the concertmaster of the Middle School All Region Orchestra (Region 16) since 2014. Beside music, Daniel likes swimming, being a member of Lubbock Swim Team for 5 years and he currently holds five team records. He also like playing video games on Xbox, listening to music and watching movies.